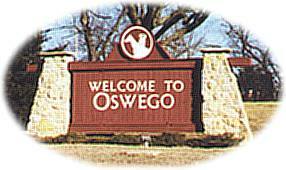 Welcome to Oswego, located in the heart of Southeastern Kansas. Nestled in the center of a region where attractions are abundant, our city invites you to stay and enjoy our facilities, browse through area shops, and simply relax while viewing some special sights that you won't find anywhere else in the world. Oswego's history goes back more than a century and a quarter, to the time of buffalo traders, Indian encampments and burning of the general store on the town's original site by Union soldiers during the Civil war. Osage Indians first occupied the area, followed in 1861 with the establishment of a trading post, owned by John Matthews. Matthews' trading post was burned by Union soldiers from Fort Scott and about six years later, the town of Oswego was incorporated. The Oswego settlement is believed to be the site of the first permanent settlement of white people in Southeastern Kansas. The second settlement was Fort Scott, which became a Union fort and played a prominent role in the Civil War. Oswego received its name by residents form New York living here appropriating the moniker from the city of the same name in their original New York home. Following the Civil War, veterans began to stake land claims and rebuild the settlement. the original area is marked by the Little Town well on Union Street. Oswego was built by settlers from various areas, with the main street--Commercial Street--much as it is now. However, the original buildings were wood, and in 1880, the entire west side of the block between Fourth and Fifth Streets burned. Store owners immediately began rebuilding, an an inspection of many of those building show evidence dating them to the rebuilding effort after the fire disaster. While Oswego always has had an agrarian society as its base, the site of two major railroads made it an important transportation link. Nationally acclaimed sports artist, Ted Watts, maintains a studio here and tours may be arranged. Sports Illustrated described Watts as "one of the fastest-rising sports illustrators in the country." For information on moving to, or visiting Oswego, Kansas, stop by the Visitor's Center housed in an authentic Missouri, Kansas, and Texas (MKT) Caboose. Celebrate the 80thAnniversary of the Oswego Swimming pool and Oswego City Park grand opening.